Solving problems relating to using the measures of the interior angles of polygons. 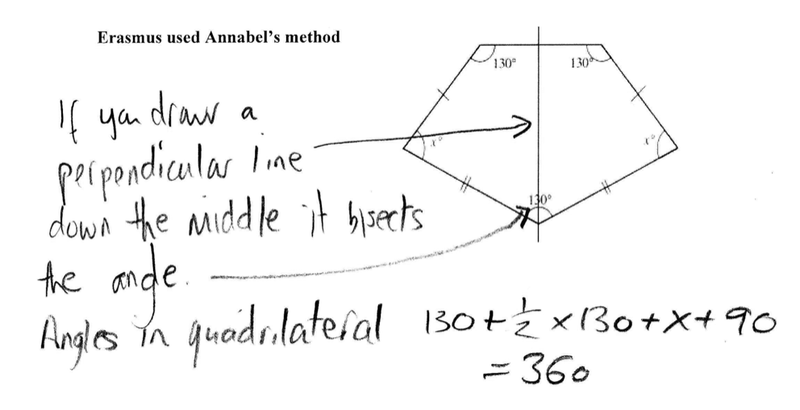 Solving problems relating to using the measures of the exterior angles of polygons. Before the lesson, students work individually to complete an assessment task designed to reveal their current understanding and difficulties. During the lesson, students work in pairs or threes on a collaborative discussion task. They are shown four methods for solving an angle problem and work together to complete the problem using each of the methods in turn. As they do this, they justify their work to each other. Working in the same small groups, students analyze sample solutions to the same angle problem produced by students from another class. They identify errors and follow reasoning in the sample solutions. There is then a whole-class discussion, in which students explain the reasoning in the sample solutions and compare the methods. Finally, students return to their original task and try to improve their own responses. Each student will need two copies of the assessment task Four Pentagons and a copy of the lesson task The Pentagon Problem. Each small group of students will need a copy of each of the Sample Responses to Discuss and a copy of the Geometrical Definitions and Properties sheet. 15 minutes before the lesson, a 60-minute lesson, and 10 minutes in a follow-up lesson. All timings are approximate. Exact timings will depend on the needs of the class.